The NRA has called me several times over the last few weeks. It hasn’t really added to the problem of 10 or more calls from telemarketers that I get every day; maybe I just expect better from the defenders of the second amendment than to be harassed at home by their monetary fishing expeditions. A few years back I responded to a survey that the NRA sent me and ever since then they’ve decided that I’m a great untapped fiscal resource. While I think it’s sweet that they thought of me, I have a little problem with them, and here it is. The NRA wants to protect hunting. Not the right to keep and bear arms, hunting. For the NRA the argument is only about the rights of gun owners to go out and shoot at animals as a sport, not about maintaining an adequate defense of the nation from enemies foreign and domestic. And that is a problem for me. I’d give to the NRA if they only had the balls that they act like they have. If you want to know what I mean, drop by the GOA (Gun Owners of America) site and take a look at what they have to say on the issue of guns and gun possession, and then go and read the documents that formed the republic that was the US. Once you’ve done this you’ll probably begin to understand that hunting was never an issue for the framers. Oh, hunting was part of the deal, while you were out drilling with the militia you had to eat something; but they didn’t want the average person to have guns so that they could hunt deer on the weekends. The reason is, that an armed and trained population is a force to be reckoned with all on it’s own. The ability to stand up and say no when push comes to shove is something that keeps the power hungry at bay. Or it should. The average man not just having, but being trained in the use of weapons is key to the deterrent effect. Outside of a few active militias, that training is sadly lacking. Without the training, guns in the hands of average citizens is a minor deterrent at best, which probably does more to explain the current state of the union than anything else. Without education, without an understanding of how and why things work the way they do, all our potential is wasted. A loaded gun just waiting to be misused. And misused it most likely will be. 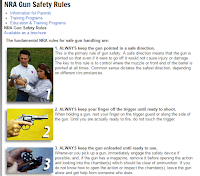 This is the first post I wrote on the subject of guns for the blog. While I’ve owned guns for as long as I can remember, I never felt much of a need to write about them. Living in the small towns that have been home for most of my life, I never met anyone who didn’t own a gun. In Texas there are few people, even in the cities, who don’t own firearms. It was Austin where I met my first gunphobe (as opposed to a gunnut or ammosexual) someone with a pathological fear of firearms. Over the years I’ve met many of them, so I don’t doubt they exist. But like christians insisting that they are persecuted when they can’t promote their religion everywhere they want to, gunnuts are convinced that they have to be allowed to display their favored fetish everywhere or they are being disarmed. This is the problem that has developed with the NRA in the years after writing this post. This always was a problem with the GOA (which has rightly run afoul of watchdog organizations that track hate groups) it just wasn’t recognizable until after the court decision that allowed citizens to defend themselves with firearms wasn’t enough. After a dozen states and more had passed Stand Your Ground laws that have been shown to be horribly flawed pieces of racist legislation. Disarming the population isn’t a solution to the violence problem, although it will reduce the number of gun deaths. People will still beat each other to death with bats, stab each other to death with knives. On The Other Hand, giving everyone a gun will actually lead to more gun deaths, this is a statistically unavoidable outcome. It will happen as a simple side effect of there being more weapons in more hands. No, the firearm problem is best addressed with something like what Jim Wright offers over at Stonekettle Station in his piece Bang, Bang Sanity. 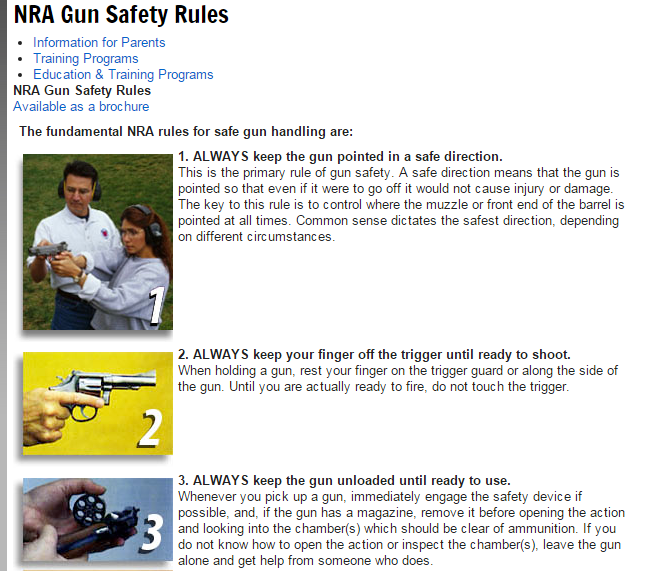 Solutions based on the NRA’s own gun safety guidelines. If we pursued liability for gun miscreants as Jim outlines, mass shootings would rapidly become a rare occurrence again. It is too bad that not even the NRA can recognize their own rules anymore. Previous Previous post: Sony: What do they do for the pirates? Next Next post: Your ALD and ELD have doubled!